The cow that was rescued by firefighters at Arisaig. Scottish Fire and Rescue appliances, one from Fort William and two from Inverness, were dispatched shortly after 10am to help crofter Hugh MacDonald with his cow that become trapped in a bog in Arisaig. Mr MacDonald said he had become aware that Dolly was in distress when the animal didn’t turn up for morning feed. 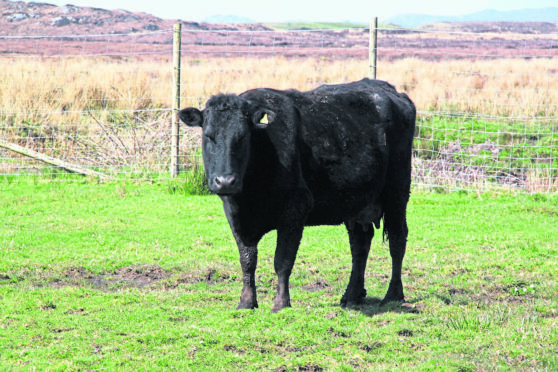 The cow was lodged in a bog on Kinloid Road, off the B808 – near the centre of the west coast village, and could not get out without assistance. Emergency services were called shortly after 10am with the crew from Fort William arriving on scene within 30 minutes and the two appliances from Inverness arriving after 11.15am. The crew from Fort William dislodged the 18-year-old animal shortly after 1pm. Speaking after the incident, the cow’s owner Hugh MacDonald said: “10 out of 10 to the crew from Fort William who got her out. She got stuck coming over for her food in the morning, and she was sinking in the bog. The more she struggled the worse it got. “She probably got pushed onto the soft ground by the other cows when they were coming in. This is the first week they have been out overnight. “I was meant to go to the mart in Dingwall today, and it is down to fate that I didn’t go, because she would have been stuck there – and the likelihood is that she would have died. “Dolly is a native cow, she had a boy calf this year – it was up in the barn looking for her, when she was down here. A spokeswoman for Scottish Fire and Rescue service said: “We were on the scene at the incident in Kinloid Road in Arisaig where a cow has become stuck in a bog. “It can be very difficult to get a cow out of a bog once it becomes stuck as the animal starts to struggle and in doing so, gets more stuck.